The Type 002 aircraft carrier is a second generation Chinese aircraft carrier design. The ship will be the first Chinese aircraft carrier to be equipped with a catapult. China has been flight testing a new variant of its J-15 navalised fighter modified for catapult-assisted take-off but arrested recovery (CATOBAR) operations, according to images posted on Chinese online forums. Released on 15 September, the images show a Shenyang Aircraft Corporation (SAC) J-15 in flight featuring what appear to be modifications to its front undercarriage that would enable the aircraft to conduct catapult-assisted take-offs: yet another indication that China may be planning to develop a CATOBAR aircraft carrier. 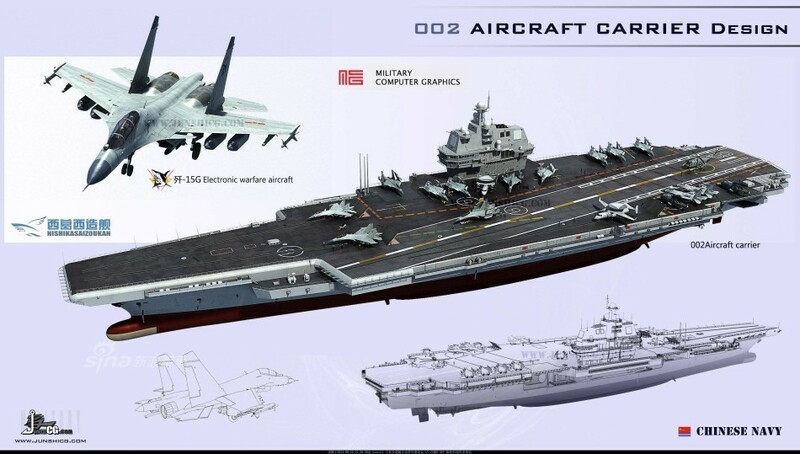 Expectations that China’s third carrier, which is commonly referred to as the Type 002, will be equipped with catapults were reinforced in early August when images emerged on Chinese online forums showing the country’s land-based aircraft carrier mock-up in Wuhan, Hubei Province, undergoing modifications. Most significantly, the ski-jump section had been removed from the mock-up. Construction of China’s third carrier is expected to take place at the Jiangnan Changxingdao shipyard near Shanghai. So far there has been no official confirmation of the programme, nor visible evidence of the construction, but there has been considerable speculation that production of the initial modules is already in progress. Airbus Defence and Space imagery captured on 20 June 2016 already showed that significant progress was being made on two land-based catapult tracks for testing and training. Constructed at the People’s Liberation Army Navy (PLAN) carrier air wing training facility at Huangdicun Airbase, the two tracks consist of a steam-powered track and an electromagnetic catapult track placed at the northeastern end of a new runway under construction. Installation of both suggests that a final decision on which system to adopt may not yet have been taken.